Saturday 27 August saw me birding at Spurn, East Yorkshire. Migration highlights included a cream crown Marsh Harrier south over the Humber with the Kilnsea Triangle holding several Whinchat, Common and Lesser Whitethroats, Willow Warblers and a Redstart. Waders were plentiful with a walk over to Kilnsea Wetlands/Beacon Lane Ponds producing loads of Dunlin with others of note including Greenshank, adult and juv Curlew Sandpipers, Wood Sandpiper and Little Stint. Beacon Lane itself was quiet although nice to see Wall Brown butterflies. Prior to a late afternoon seawatch an immature Skua spooked the waters on the Humber shore and headed out to sea at The Warren. Immature Arctic methinks, photo below. It looked big to the observers, but I'm favouring Arctic. 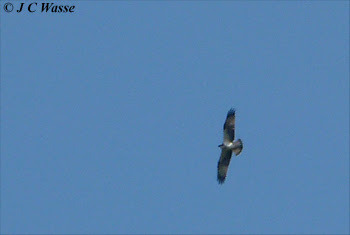 It was a question of getting a photo and analysing the photos or studying the bird as it flew over, the former won out. The seawatch produced a slow trickle of Common and Sandwich Terns south and a Black Tern was amongst them, but heavy rain soon set in and ended the show for me. Sunday 28 August and an afternoon seawatch at Flamborough Head, East Yorkshire. A slow session despite NW winds but connected with about 10 Arctic Skuas and a handful of Great Skuas heading south, with no more than a handful of Manx Shearwaters noted as well. 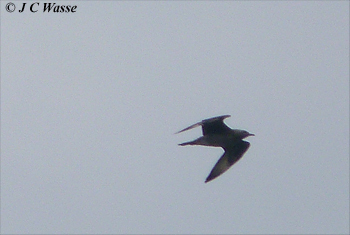 Waders on the move included Whimbrel, Curlew and Golden Plover. Nice to catch up with the locals et al. Love seawatching and always learning! Monday 29 August and birded the Barnsley moorlands with my dad. Spotted an adult Caspian Gull amongst a group of LBB Gulls resting in fields near Ingbirchworth Res., South Yorkshire, and nearby watched for migration along the moorland edge at Ewden Heights and then at Midhope Moor. Simmo and Upland Tyke were watching from the Cabin up the valley and connected with an Osprey which eluded us at Midhope Moor. Other highlights included Marsh Harrier and Hobby plus Buzzards and Ravens. Tuesday 30 August and a repeat of the above, except birded from Ewden Heights only after visiting the Ingbirchworth area. 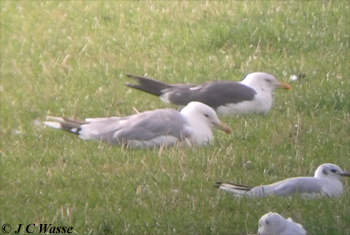 The Caspian Gull was again near the Res. before flying high east about 10am ish, leaving the area? Simmo again birded from the Cabin. At about 11:30 I picked up what I thought was an immature 'Gull' over the ridge leading East from Ewden Heights and I was about to move off it as it seemed to be going away when something kept my interest in it. A nagging doubt on its id. It soon turned and revealed itself to be an Osprey. It then came towards us (photo below) and I managed to call Simmo who got onto the bird before it bombed south towards Agden. Soon afterwards a 'new' Marsh Harrier appeared and went high south, at least 1 or 2 others lingering here. 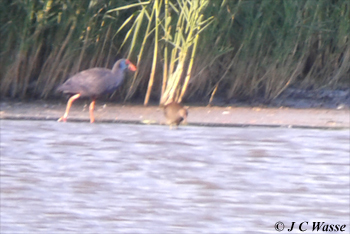 A relaxing afternoon at home before driving to London was stopped in its tracks when news of Purple Gallinule (OK let's be fashionable and call it 'Western Swamphen') at Alkborough Flats on the Lincolnshire side of the south Humber shore to the north of Scunthorpe. Connected with this beast just before 17:00, it dwarfed a Moorhen. The scrape held a nice selection of waders with many Avocets and Spotted Redshank noted amongst others. As always a fantastic stay back at home.